Jesse Dill recently brought in a crew of amateur actors to play volleyball, toss a Frisbee around and enjoy a barbecue on a $1.2 million property he was selling for a client. While the actors had a blast, Dill had a drone buzzing overhead to capture video. Stir in a little music and the real estate broker had a mouth-watering commercial that would bring in potential buyers from far and wide. Real estate brokers such as Dill are on the cutting edge of using drone photography, and other businesses and organizations are taking note. Dill said more than 90 percent of real estate buyers use the Internet to look for their next home, making eye-popping videos and photos all the more important. An impressive sales campaign also gets shared through social media and already has resulted in new customers for Dill, who now does still photography with his own drone but hires out for more complex video work. Dill demonstrated his drone camera’s photography capabilities recently while conducting a test flight over The Round in Beaverton. His iPhone, loaded with a special app and synced to multiple satellites through its GPS system, allowed him to get a drone’s-eye view from high above The Round with his feet still firmly planted on the ground. A few days later, Dill volunteered to take photographs at the same location during Last Tuesday to illustrate the Beaverton Area Chamber of Commerce’s Community/Visitor Guide and Business Directory. 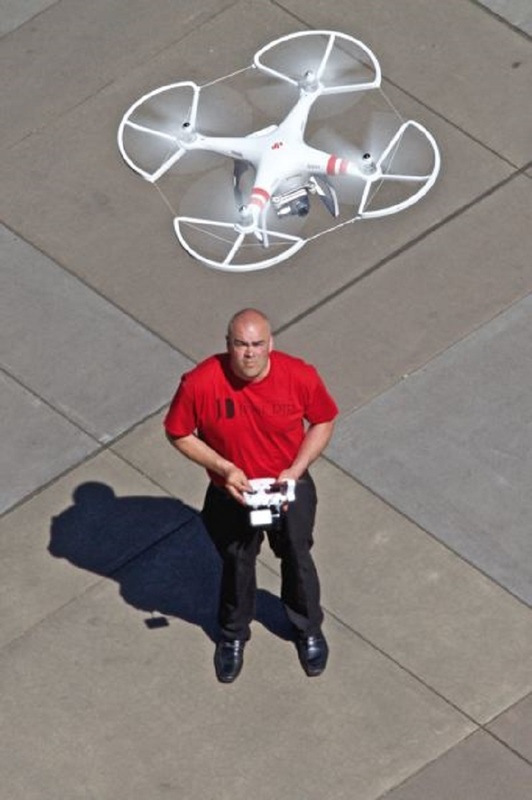 James Older, co-manager at Drones Plus business people than hobbyists are shopping at their new Beaverton location. Older said other businesses are starting to get into the act, ranging from roof inspectors who want to get a good look at hard-to-access buildings to farmers who can keep track of widespread operations more effectively with aerial support.